S&P 500 futures trading lower overnight following statements from Chinese Premier Wen that China would control the pace of new lending and that Chinese banks have been told to stop lending for the rest of January. S&P 500 futures was not able to break above the 1150 on yesterday’s rally and we still see weakness in the chart from Friday, with a wide spread down bar, a bearish engulfing pattern in candlestick terms. This confirms the weakness from Monday last week that looked like an up trust, meaning market players take prices above a resistance level to trigger stops only to drive the market lower later on. So we are still looking at possible shorts if the right signal present itself, not seen it yet. We reiterate our view from yesterday’s report “The price action following the JP Morgan and Alcoa better than expected might signal as shift in the market sentiment to higher demand from investors of top line growth and not only cost cutting. We believe this will be very important going forward and we will focus more attention to the top line numbers and the companies forward looking statements than the actual earnings number.” The Greece issue is still hurting Euro and market seems much focused on the debt problems of Greece and other Euro zone member that might face downgrades. We actually think the increasing public debt will become an issue sooner or later this year and we expect this to be more reflective in the exchange rates. Countries that catch our attention are: Japan with the highest public debt in the G-10, UK and USA. The price action in EURUSD so far this year has really been driven by the Greece issue and problems of the Euro zone, meaning that EUR struggles every session this theme has been on the agenda in form of news article or Central Bank speak. JPY also struggled over a few days when there was debate over the ability to finance their debt. So with this in mind, we have put in a chart with S&P 500 futures vs. EURJPY over the last 2 years. It displays clearly that the correlation between the two contracts have fallen from start of November 2009. We used to use EURJPY as a risk appetite parameter, but not looking like the correlation to S&P it is working all that well lately. Is that a change of correlations or more indicating that either S&P or EURJPY is mispriced and a stronger move is on the way? Not sure yet, but we pay attention to EURJPY to find any clues over the next few weeks. Crude still seems rather offered and keep in mind that inventory data is out tomorrow, which is always a potential mover, so we are cautious taking new positions today. USDJPY bounced off the 90.50 to 90.70 zone once more as we pointed out in yesterday’s report, that area should be an area trader’s look to get long after the strong rally. One can expect traders to buy into pullbacks for some time at least after such a strong rally. GBP continues to perform really well following a string of stronger than expected economic data and hawkish comments from BoE members. We have seen several hawkish comments on UK over the last week, suggesting that a rate hike is being priced in more aggressively now, giving support to GBP. We would like to remind that the DOE Inventory data is scheduled for tomorrow due to Monday’s Holiday. 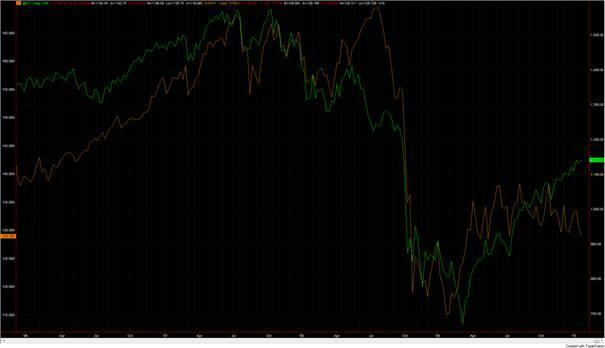 EURJPY vs. S&P 500 futures, see how the correlation has been totally off the last few months. Euro: Was never able to reach the resistance at 1.4630 and broke lower Friday, bearish tone below 1.4450 now with 8th of Jan 2010 low of 1.4262 being support. The break below 1.4200 this morning opens for a test of the 1.4000 support level near term. Cable: Traded above the 1.6410 resistance level yesterday, but fell back towards the close and closed at the lower end of the daily range, nearly 100 pips off the high. Look like an up trust on the daily chart now, so would be a bit careful today to evaluate how strong that up trust really was. In general we expect the GBP to do relatively well compared to Euro for as long as the Euro trades with a bearish momentum, therefore we think selling EURUSD is a better alternative to get long USD. USDJPY: We see longer term falling trend line coming in at 94.06, which is still the key level to break to open for a stronger run higher. We expect sellers to use this level to look for a correction on the strong run from the 85 at 27th of Nov 09. We have 50% Fibonacci of the move from 84.83 to 93.76 coming in at 89.29 and we expect buyers to step in towards this level. Longer term we still expect JPY to underperform due to high public debt, weak demographics and tougher export markets due to slower growth going forward. Swissy: Broke out of the triangle on the daily chart when it traded above the 1.03 level, looks likely to test 1.05 next. AUDUSD: Broke the interim rising support line overnight and recent uptrend is broken with 89.05 as the next support major level now. Watch S&P for direction in this pair. USDCAD: Break above 1.04 today confirms a short term bottom has been put in place at 1.02 and expect to see a move towards 1.07. EURJPY: JPY trading strong and 129 level broken today, 127.32 is next key support. We still like to sell JPY on rally’s as we expect to see a weaker JPY in 2010. GBPJPY : Bullish above 146, with strong resistance up at 151.